a few years ago. I picked it up and started reading, and I fell hard. Natalie's like a dear, wise friend, one who tells you to: "say what you mean," and "push yourself further." Wild Mind: Living the Writer's Life is her second book on writing and it's also fabulous. I've got one volume with the two books together, and it sits on my filing cabinet, ready to be picked up and leafed through at any moment. It's dog-eared and the cover is ripped because I'm tough on the books I love. I like to think of these tears and creases as the book's wrinkles. Its laugh lines. Natalie's a big fan of getting your first thoughts down using a pen and notebook. These days, I seem to spend a lot of time at the computer. Call me old-fashioned, but I think I'll always prefer a little table in a cafe, with my spiral notebook, a mug of strong coffee, and a plate with some kind of delightful baked good sitting on it. Most of the time my writing is crap. But every now and again, I'll get on the second, or the third, or the fourteenth page of what I'm working on, and something cracks open. My pen is connected directly to my heart and I'm just letting it out. Speaking my truth. Later, I'll look down at what I've written and be amazed by it. And that's what I live for. Can I share with you one of my favorite quotes from Wild Mind? "I write because there are stories that people have forgotten to tell, because I am a woman trying to stand up in my own life. I write because to form a word with your lips and tongue or think a thing and then dare to write it down so you can never take it back is the most powerful thing I know." Have a bold weekend, story-makers. See you back here on Monday for another wee tale. 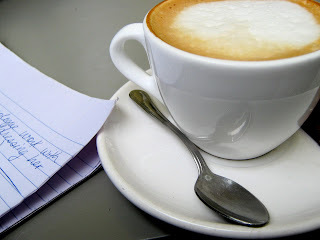 Do you want to know what I liked the most of what you wrote in your blog this morning? That you addressed it to us - "story-makers". That made me think. We may not all be "writers, but we all have stories going on in our lives. Everyday something happens. Little things, sometimes BIG things. I decided before my first grandchild was born, that I would write her letters every month, and then each month after her birth, I've continued to. I keep them in an envelope, and after I die, she will get them. It will be my gift to her. It will tell her that I thought her life was a WONDERFUL story worth writing down. Brittany, thank you once again for all of your inspired stories. I love them!